Cruise ship design is a very personal thing but let’s have a look at some of what’s out there these days, including some of their more desirable elements as well as some of the less desirable. We look at wrap-around teak promenade decks, real steamer chairs with blankets and forward-facing lounges, but also at gyms that rob those same forward-facing views from other passengers. We look at two of the more elegant classes of cruise ship, the “R” ships from St Nazaire and the “Vista” class from Marghera, which include two of Cunard’s Queens as well as P&O’s Arcadia and Holland America’s Nieuw Amsterdam. Elsewhere, MSC announces that it will escape the Dubai crowd by sailing from Abu Dhabi next winter (although still allowing a Dubai embarkation option). Meanwhile, the number of cruise visitors to Antarctica is set to fall further as new fuel requirements come into play. And two weeks ago we erred on Havana – the Cuban port will actually have three cruise ships based there next winter and not just the two we mentioned. Last week, Gill’s Cruise Centre, reportedly the third largest cruise retailer in the UK, ceased trading after burning its candle at both ends. Not only had it been rebating too much of its commission to “buy” bookings but it had also been overspending on a Central London call centre and on national advertising. We have a look at some of the reactions and revisit the failure of Cruise Control, the last major UK cruise retailer to go bankrupt, in 2005. Photo of Grande Mariner at Detroit by Dan Janisse, The Windsor Star, 18th July 2011. Elsewhere, while Los Angeles has been thought of as the US West Coast’s cruise centre ever since Princess Cruises opened in that city, now Seattle, with Holland America Line and Windstar Cruises, as well as newcomers Seabourn and Paul Gauguin and a bevy of small ship operators, puts up a good case for taking the lead. And with a first call this weekend by Blount’s Grande Mariner, Detroit has now opened its new cruise terminal. There is talk of a new line handling twelve passenger embarkations and disembarkations (six turnarounds) there in 2012, with cruises to and from Chicago, Duluth and Quebec City. CUBA Cruise has announced that it will not proceed with planned cruises for the 2011-12 winter season but will postpone the launch to December 2012. Cuba Cruise was scheduled to commence operations December 4. Although everything was in place for a successful operation and early sales were indicative of strong demand, the company decided that more time was needed to develop sales channels within the travel agent community. Cuba Cruise regrets the postponement and sincerely apologizes for any inconvenience this action may cause for consumers who have already booked, for our preferred sales partners, as well as for Louis Cruises from whom arrangements had been made to charter the vessel Louis Cristal. All bookings that have been taken to date will be fully and promptly refunded by Cuba Cruise. As part of her commemorative 40th Anniversary Transatlantic voyage from Rotterdam to New York and back this month, Holland America Line’s flagship Rotterdam called in at Southampton yesterday on her way to New York. This voyage celebrates the fact that it was forty years ago that Holland America Line operated its last full schedule of Transatlantic sailings. Several prospective Holland America clients and cruise agents visited the ship on the event of her call for an inspection and lunch, followed by a brief presentation from the line. We took advantage of the ship’s Southampton visit to meet up with some of our own passengers who had boarded in Rotterdam two days earlier. They are travelling to New York in Rotterdam, then returning to Southampton in the Queen Mary 2 in August. Ninety passengers also embarked at Southampton. One of the things that Holland America Line is best known for is its wrap-around teak promenade decks, and here you see the port side of Rotterdam‘s. 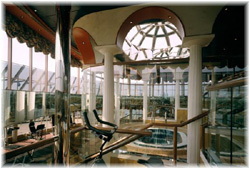 In the foreground, with the full-height silvered sliding door, is one of the ship’s thirty-nine new Lanai staterooms. These were installed in December 2009, in a conversion from outside staterooms that added a full height window and sliding door, not only allowing direct access to the promenade deck but also bringing more light into the cabin than the smaller window it replaced. Just outside the door of each Lanai stateroom can be found two cushioned steamer chairs – yet another thing for which Holland America is well known. These are reserved for private use by the stateroom’s occupants. 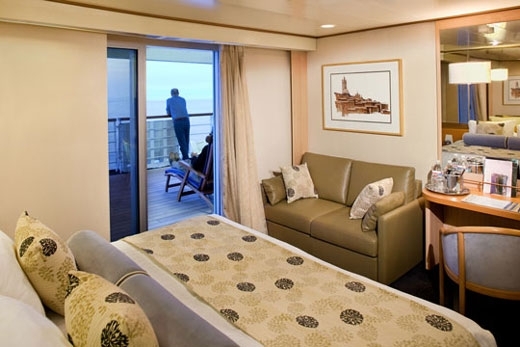 While not quite offering the privacy of a veranda cabin, Lanai staterooms are still regarded as a big improvement on the outside cabins that they replaced as they allow easy access to the promenade and fresh sea air. They are now in the process of being installed in both the line’s flagships, Rotterdam and Amsterdam, as well as its four “S” class ships – Maasdam, Ryndam, Statendam and Veendam. The idea came about because of the relative shortage of balconies on these ships compared to Holland America’s newer vessels. 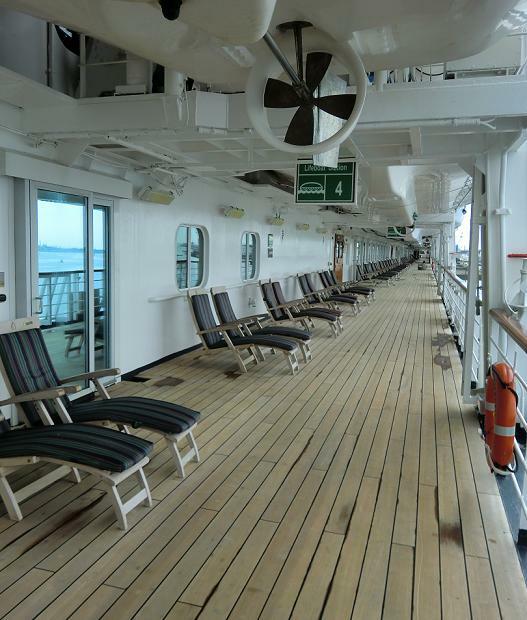 The only shortcoming of these new accommodations, if one does not mind passing strollers and joggers, occurs for other passengers, who now have less access to promenade deck steamer chairs. Beyond the Lanai cabin above, for example, one can count nine publicly-available steamer chairs, but stretching beyond those is a row of Lanai cabins with privately-reserved chairs. The Rotterdam, which will be based full-time at her home port of Rotterdam from September 2012, will also be offering two longer cruises from Southampton at the end of next year. In November 2012, she will depart on a 32-night round voyage from Southampton to the Caribbean, which will include all three of the Netherlands “ABC” islands – Aruba, Bonaire and Curacao – as well as St Maarten, and also Tortola, St Lucia, Trinidad and Barbados, as well as the Azores out and Madeira on the return. And in January 2013 Rotterdam will sail from Southampton on a 90-day long voyage to the Far East and back via Suez that will feature a two-week in depth exploration of Indonesia, the former Dutch East Indies, as well as India, Malaysia and Singapore. For further details on Holland America Line cruises and voyages please call The Cruise People Ltd in London on 020 7723 2450 or e-mail cruise@cruisepeople.co.uk.